Wavy V Ranch is the consummate recreational destination, combining a world-class lake house on a private 30+/- acre Cedar Creek lakefront lot with an adjoining 315+/- acre ranch featuring a 30+ acre private fishing lake, developed wildlife habitat, productive hay pastures and exceptional amenities. Location: The Wavy Ranch is located in a highly desirable part of Henderson County, just west of Athens, Texas and approximately 70 miles east of Dallas, Texas. FM 3054 divides and provides access to "the lake house" and "the ranch". To get from "the lake house" to "the ranch", simply cross FM 3054 and enter the gates. Directions: From Downtown Dallas, take US Hwy 175 southeast and drive ~58 miles to Eustace, TX. In Eustace, turn south (right) on Henderson County Road 316 and drive ~4.5 miles to FM 3054. Turn south (right) on FM 3054 and drive ~2 miles. The ranch&apos;s pipe entry gate will be on the north side (right) of FM 3054. The electric gated entrance to "the lake house" is just beyond (west) "the ranch&apos;s" entry, on the south side (left) of FM 3054. The foremost waterfront property at Cedar Creek Lake, Wavy V Ranch, blends sophistication with intimacy and warmth of materials and space. With 1,000 feet of improved shoreline, the 14,000 sq. ft. residence sits prominently on the southeastern most portion of the lake. The property features the work of architect Robbie Fusch, interior designer Jason Lenox, landscape architect LandVisions, and local Cedar Creek builder Bill Ackley. 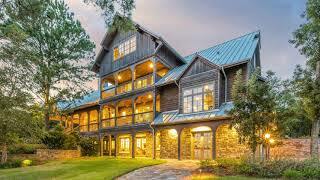 The lake house feels equally at home on the ranch, and brings together rustic and luxury. The stone-and-cedar home with galvanized metal roof features custom pieces throughout and its large, open spaces are layered with leathers, natural woods, and statement pieces such as elk antler chandeliers (measuring 7 feet in diameter) made by a local artist, an iron fireplace screen handcrafted by local artist Tom Winkelvoss, outdoor furniture by Old Hickory, and a photograph by Laura Wilson mounted on a lift that conceals a 65" television screen when not in use. By reclaiming and re-milling old lumber for the walls and floors, the house honors the past and exhibits character and charm. For full details on this exceptional custom home, contact broker. Topography: The ranch&apos;s rolling topography has ~60 feet of elevation change within the boundaries. The highest elevations are ~400&apos;, located in the southwest corner and the north and northeast corners of the ranch. The lowest elevations are ~340 and located within the lake basin, or below the lake&apos;s dam. The gradual relief changes are easily traversable in a vehicle or on foot and allow the ranch to dry quicker in wet times. Additionally, the ranch&apos;s overall slope channels runoff from rains across the hay pastures and into the private lake. Outside of the lake basin there is very little floodplain located within the ranch. Tree Canopy: The ranch&apos;s tree canopy covers approximately 60% of the ranch, mostly in northern half of the ranch. For aesthetics, numerous mature trees are strategically standing in the hay pastures to soften the landscape. The primary varieties of hardwood timber includes: oaks, elm, ash, pecan and walnut trees. Soils: The ranch&apos;s sandy loam soils are primarily Axtell and Styx loams. These fertile sandy soils drain very well and are conducive for hay pastures or crop production. Pastures: Wavy V Ranch&apos;s coastal Bermudagrass pastures are located in the southern half of the ranch on both sides of the private lake; the approximate acreage in hay production is currently 100+/- acres. The pastures have been carefully managed for weeds, fertilized regularly and benefit from an average rainfall of 42 inches per year. Currently, the ranch produces approximately 1,000 large round bales annually. There is a hay lease for the ranch with a meticulous tenant who would love to continue leasing the pastures if desired by the next owner. Road System: The ranch offers 6 pipe entry gates from various directions into the ranch. From these entry gates, navigating each area of the ranch is made easy by way of a carefully designed interconnecting ranch road system which leads throughout the ranch and to the lake, boat dock, entertainment pavilion and each deer blind and food plot. 30+ Acre Private Lake: The ranch&apos;s centerpiece is its spectacular 30+ acre private fishing. With gently sloping banks and sheltered by towering hardwood timber, this fishery was impounded for serious trophy bass fishing and creating lifelong memories on private water. Constructed in 2005 where two distinct drainages converge, the lake has nearly 2 linear miles of shoreline. The lake is maintained by several small springs and a drainage basin that&apos;s nearly 400 acres. The lake is stocked with trophy Florida bass genetics, numerous bass exceeding 12 pounds have been caught and released. The forage base consists of fat head minnows, copper nose bluegill and red ear bream. Annually, tilapia and threadfin shad are stocked as a supplemental food source to help the bass reach their potential. The lake&apos;s tannic water color is best described as "tea color", the deepest part of the lake is near the dam, ~25 feet deep. There are numerous brush piles that are anchored to metal pipes that have been buried into the lake floor; this creates a fantastic target for casting and provides vertical structure to hold fish. A 30&apos;x50&apos; fishing dock with a covered boat slip and electric lift makes fishing trips effortless for anglers of all ages and any skill level. There are three 10&apos;x25&apos; fishing docks on several areas of the lake for additional fishing options. Each dock has an automatic pellet feeder to attract and feed the fish. Deer- Wavy V Ranch has a very strong population of whitetail deer. Ample hardwood tree cover, generous water resources, three annual food plots and a year-round supplemental protein program ensures the native herd&apos;s potential is optimized. There are four tower blinds strategically spaced within the ranch. Each overlooks a food plot and corn feeder. Waterfowl- The duck hunting at Wavy V Ranch is exceptional. Two large duck blinds have been located near shallow water areas of the ranch and are easily accessed from the ranch roads. Japanese millet and other native waterfowl grasses or plants are established along edges and flats as a waterfowl food source. Duck numbers in the area are impressive and the ranch&apos;s duck hunting benefits from Cedar Creek Lake&apos;s strong annual waterfowl numbers. Other Wildlife- The ranch is home to doves, songbirds, squirrels, feral hogs and varmints. Pavilion: A spacious 30&apos;x25&apos; open air entertaining pavilion is located on a hilltop on east side of the ranch&apos;s private lake. The location is ideal for hosting family gatherings or events, in a remarkable setting. Constructed with stone pillars and retaining walls, the pavilion features a metal roof, a concrete floor, giant fireplace, electricity, water and a full outdoor kitchen that is equipped to serve large groups. Nearby there is a bathroom and additional storage for equipment. Minerals: The owner will convey any owned minerals and executive leasing rights owner, if any, at closing. Utilities: Electricity is provided by Trinity Valley Electric and run underground to the ranch amenities. A Corrizo Wilcox water well serves the Pavilion and can be used for irrigation. Taxes: The Wavy V Ranch has an agricultural exemption that will transfer to the new owner; the taxes are estimated to be ~$35,000 per year.